Irene Bermejo-Casado [CV] Researcher of GiDECoG-ISEMCO-Universidad Rey Juan Carlos (Spain) – i.bermejo@isemco.eu. Gloria Campos García de Quevedo [CV] Professor in Event Management and Researcher of GiDECoG-ISEMCO-Universidad Rey Juan Carlos (Spain) – c.campo@isemco.eu. This paper analyzes the professional stress and burnout in events management within the framework of communication agencies in Spain (selected among the main companies in the sector). The goal is to check if event managers suffer more stress, given the peaks of their activity, than other communication professionals and what their tolerance is. The methodology is based on MBI-GS and CRL questionnaires to obtain a measure of stress and burnout and their tolerance respectively. 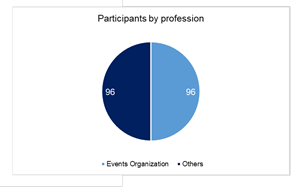 The design consists of two groups: 1) professionals in the event organization sector (n=96); 2) communication professionals (control group, n=96). This allows comparing the means obtained in each group and in each questionnaire to know which group has the highest scores in work stress and in tolerance. The results will allow to determine if the peak of work, by the organization of events, is a reason or not of a greater stress and burnout of the professionals of the sector. Work stress, burnout syndrome, occupational hardiness, event management, occupational health. 1. Introduction. 2. Research goals and hypotheses. 3. Approach to stress and burnout in event professionals. 4. Tolerance to work stress, resilience and resistant personality. 5. The profile of event organization professional. 6. Work stress and quality of life in the organization of events. 7. Design of the measurement. 7.1. Participants. 7.2. Procedure. 7.3. Results and discussion. 7.4. Study limitations and possible improvements. 8. Discussion and conclusions. 8.1. Work stress and tolerance to it. 8.2. Impact in the event organization professional. 8.3. Future lines of research. 9. References. 9.1. List of references. 9.2. PhD dissertations. 9.3. Electronic resources. 10. Annexes. The role of the event planner and its own professional sector are starting to consolidate (Campos, 2016a), but it has already wide background in the framework of communication agencies (specially in Spain). However, the scientific-academic researches specialized in the issue are still scarce (Campos & Lafuente, 2013). Therefore, this paper, which attempts to investigate in such a changeable society (Sánchez-Bayón, 2016), and in a reformulating sector right after the global crisis of 2008 (Campos, 2016b), has as main goal to elucidate a polemic that flies over the consolidating stereotype regarding the event planner, who given the nature of his or her work and the activity peaks involved therein, it is supposed to be exposed to a higher work stress than other professionals of the business. To perform this research, we searched the main communication agencies in Spain, outstanding in events management. Thus, a new research line opens towards the analysis of their work conditions and quality of life, focusing in the stress events’ planners experience at work (and compared with their workmates in agencies). The hypothesis that constitutes this study’s backbone, as we have been saying, is to confirm whether professionals of event organization suffer more work stress than the rest of colleagues of the business and which is their tolerance about it. If their tolerance (which is the corollary of the stereotype in consolidation), this will allow event planners to work in an efficacious manner even when they are continuously exposed to high levels of demand (especially, during the event itself). In order to confirm whether the previous assumptions are true, the present research is performed and consists in an experimental study of explanatory nature which compares the stress levels in a sample of event organization professionals with another one comprised by professionals of other areas. We consider that this research is of scientific interest because it uses rigorous and contrasted research methods (Sánchez-Bayón, 2010), enabling to perform an empirical study of work stress in the selected sample. Likewise, quantitative data collection instruments are used, which undergo statistical analysis afterwards. In this way, we look forward to generating an objective, systematic, organized and coherent knowledge that allows results discussion and formulating well-grounded conclusions, rejecting –if applicable– the hypothesis suggested initially. This research is of academic interest since the object of study is genuine and has not been suggested or studied before. At the same time, it attempts to offer a greater visibility to psychology, and with it to occupational health, within the business of events organization. Moreover, this turns it into an issue of business interest, especially in the area of human resources, when it comes to selecting professionals with a suitable profile that is efficient before demands they might be submitted to, especially during the most intensive work days corresponding to the days prior to and/ or during the event itself. Thus, companies could take measures to assess and even alleviate and prevent work stress these professionals might suffer. At the same time, this study promotes the betterment and acknowledgement of the work of the events organization professional and offers visibility to his role in our society, a reason why this research is also considered of social interest. Lastly, this research is of personal interest as well, because for its author it constitutes a first approach towards the study of occupational health in professionals of the sector of event organization, which we attempt to contribute to the improvement of their quality of life with. The present paper tries to analyze the levels of work stress suffered by professionals of the event organization sector to measure and compare them with those experienced by professionals of other communication areas. At the same time, we approach tolerance to stress (hardiness) the professional of event organization has to confirm whether it is similar to that of other professionals of the sector or not. Besides, the years of professional experience in both groups are controlled (event organization vs. other areas) to check if it influences in the management of work stress. Likewise, the possible differences between men and women are studied both in the levels of work stress as well as in tolerance towards it, therefore the participants’ gender is controlled as well. The main hypothesis of the present study is that professionals of event organization suffer more work stress than communication professionals. A second hypothesis is that professionals of the sector of event organization show a greater tolerance to work stress compared to other professionals. The third hypothesis is that the greater professional experience of employees (both of event organization as well as the communication area), the greater will be their tolerance to stress. Stress is a concept that can be understood today from different perspectives since there still doesn’t exist an accepted global definition (Becerril, 2015) despise the attempts to define it through history. Currently and as a consequence of the different models proposed up until now, we can understand stress at least in three different ways. The first one is as a non-specific response of the body towards a demand manifested as a psycho-physiological stimulation (hormone and neural) that can fatigue the body and lead it towards it malfunctioning and illness or energize it leading it towards a healthy and productive behavior instead. A second option is to consider stress as a physical, social or psychological event that alters the normal state of the body and towards which the body tries to adapt. We distinguish here the eustress or positive, adaptive stress and able to drive the individual, and the distress, which is the negative stress that can have a prejudicial impact on wellbeing. The third and last form proposed is understanding stress as a process of interaction where a stress factor leads to stress reactions known as strain. In 1936, Hans Selye understood stress as “a set of physiological responses, mainly hormonal” (Sandín, 2003; p.143). Thus, he suggests that the organism tries to keep a state of physiological balance (called homeostasis) through these responses or changes in the body, known as allostasis. The expense for the brain and the body of a continued allostatic response is known as allostatic load, and if it is prolonged by a time superior to what the body can bear, negative consequences may appear and even certain pathologies in extreme cases. Applied to stress, this would mean that a stressful event would cause the already mentioned physiological responses in the individual, which purpose is to cushion the effects of said event and keep homeostasis. Fig.1. Stress and homeostasis. Source: authors’ own creation. This mechanism is known as General Adaptation Syndrome and it is constituted by three stages: alarm, resistance and exhaustion (Selye, 1976; quoted by Hobfoll, 1989). Later, Lazarus and Folkman (1984) suggest there is a cognitive evaluation by the individual: any event can be evaluated and experienced as stressful by an individual. Therefore, not all events are experienced as stressful by all individuals nor to the same extent. As Hofboll (1989) says, these two models have in common that stress is not the product of an objective imbalance between the demand and the response capacity of an individual, but instead it depends on the perception of it, hence subjective. We can observe that it is here where individual differences play a role (Cox, 1980; quoted by Gutiérrez, Hernández & Jiménez, 2000). At the same time, with Thomas H. Holmes and his interest by the social context and illness, the psychosocial approach of stress starts to consolidate, since stress is positioned outside the individual, being the social conditions the stressful agents. Fig.2. The stress process. Source: Authors’ own creation. At this point it is advisable to differentiate between 1) stressor: event of the environment triggering the stress process; 2) stress: process where environmental events trigger a series of physiological and cognitive reactions; 3) strain, what the individual suffers as a consequence of that stress (Ganster & Rosen, 2013). This paper considers stress as that interaction process where besides there is “an perceived imbalance between demands and the capacity of the individual to respond to those demands under conditions where failure in the situation’s solution has relevant perceived negative consequences” (McGrath, 1976; quoted by Monte, 2013). Work stress, also known as occupational stress, is suffered by the employee and may affect his physical and psychological health and therefore, his quality of life (Gómez-Jarabo & Bernardino, 2003; Casanova S., Lima, Aldana, Casanova P. & Casanova C., 2003). It is related to a workload increase, reduction in the perceived control over work, difficulty to conciliate family and work life and with work uncertainty among others. Some psychosocial risks that contribute with the onset of this problem are subtler, like a contradiction between superiors’ demands or an insufficient clarity of tasks to be developed in the job position. Likewise, participation in decision making as well as the influence of the employee over his work or a correct communication with workmates, are variables to be considered. According to what the European Agency for Safety and Health at Work (EU-OSHA) published at the end of 2015 “stress at work is the second work-related health problem more frequent in Europe”. It also mentions that it is the cause of almost fifty percent of all loss working days and entail an annual cost of 136.000 million Euros for the European economy due to lack of productivity, work absenteeism and the subsequent sick leaves. Regarding the concept of health, it can be highlighted that until 1948, a year when the World Health Organization defines the concept of health as “a complete state of physical, mental and social wellbeing, and not only the absence of illnesses or diseases” (WHO, 1946; quoted by Becerril, 2015; p.148), it was understood, from the biomedical approach as the absence of disease without delving in the positive dimension of wellbeing. A large number of studies mention that work stress has a relevant repercussion on health (Becerril, 2015; Gutiérrez et al., 2000), as evidenced through different psychological and biological indicators, and subsequently, in organizations, impacting negatively in the quality of service offered by employees, contributing to absenteeism, undesired rotation and even abandonment of the job position (Quick et al., 1997; quoted by Gutiérrez et al., 2000). Moreover, both stress and burnout have been related to the onset of psychosomatic diseases and behavioral, emotional, family and social disorders (Boada & Ficapal, 2012; quoted by Becerril, 2015) and with work absenteeism and the deterioration of quality of life (Becerril, 2015). Regarding the psychological wellbeing, we have seen how there is a worsening of mood under work stress situations (Serrano, Moya-Albiol & Salvador, 2008; quoted by Rosa, Albiol & Salvador, 2009). This problem is also reflected in some biological markers such as an increase in blood pressure, cortisol levels and even in immunological system parameters (Rosa et al., 2009). At endocrinological level, the hormone related with work stress the most is cortisol, a highly sensitive indicator to general stress and chronic stress in particular. Other hormones follow such as adrenaline and noradrenaline. Besides, if the perceived control of work by the individual is low, demands would produce high levels of adrenaline and cortisol, which would have prejudicial consequences in the cardiovascular system (Steptoe, 1981; Karasek et al., 1982; quoted by Rosa et al., 2009; Bosma et al., 1997). Thus, according to Rosa et al. (2009), being under a stressful work context could cause responses in the organism at psychological, cardiovascular and endocrinological level that, in case of perpetuating and not producing an adaptation, would lead to a chronic stress and their respective cardiovascular pathologies and hormonal imbalances. Likewise, other factors modulating the cardiovascular response to work stress have been found, such as gender, age, socioeconomic status, personality traits, ways of coping with stress, social support and work environment (Fernet, Guay & Senécal, 2004; quoted by Rosa et al., 2009). Response to the work chronic stress leading to the experience of feeling emotionally drained, the development of negative feelings and attitudes towards workmates (depersonalization attitudes), and the onset of devaluation process of the own professional role (lack of personal accomplishment at work)” (p. 65). Three dimensions of burnout are observed: 1) emotional exhaustion, 2) depersonalization and 3) lack of personal accomplishment (Maslach, Schaufeli & Leiter, 2001). The development of the burnout syndrome depends on three types of factors as mentioned by Bresó, Salanova and Schaufelli (2002; quoted by Duarte, Dessens & Miranda, 2012): individual variables, social variables and organizational variables. It is interesting to mention that the initial studies about the burnout syndrome mainly focused on studying the professions of assistance nature, because it was considered a consequence of the interaction of employees with services users (Freudemberger, 1974; Maslach and Jackson 1982; quoted by Moreno-Jiménez, Rodríguez & Escobar, 2001). Nevertheless, many authors have suggested the burnout syndrome as the result of chronic stress, mainly work-related, that affects different non-assistance activities and professions (Moreno-Jiménez et al., 2001). Soria et al. (2005) suggest extending the burnout concept to all types of professionals and not only to those linked to the area of people-oriented services, like professionals of healthcare, education or social work. The study of the opposed to burnout is also outstanding: engagement, which is defined as a “positive mental state related to work and characterized by the vigor, dedication and absorption” (Schaufeli et al., 2002, p.79; quoted by Soria et al., 2005; p.171). Even though research projects about engagementare scarce due to the novelty of the concept, these constitute a displacement of the negative focus of attention predominant until now to start focusing on positive aspects of work and not only dysfunctional processes. Seligman and Csikszentmihalyi (2000; quoted by Soria et al., 2005) suggest that this change is an indicator of the boom of Positive Psychology in the last years. Many authors mention that burnout is associated to different health problems, satisfaction, professional performance and quality of life (Maslach and Jackson, 1986; Cox, Kuk and Leiter, 1993; quoted by Gutiérrez et al., 2000; Maslach et al., 2001; Gómez-Jarabo & Bernardino, 2003; Pérez, 2010; Becerril, 2015). Tolerance to work stress can be defined as the capacity of the individual to resist and cope with it. Besides, it is considered as one of the main traits of resistant personality, a concept we will talk about at the end of this section. Given that the models that considered the stress process as a mere response of the individual without interaction with the environment became obsolete due to not explaining the phenomenon as a whole. Currently, more attention is given on aptitudes and traits of individuals to respond before the stressful event. Due to this change of perspective, the models offering a more leading role to individual differences, the organism’s and personality’s as behavior system have gained strength (Cox, 1980; Fierro, 1983; quoted by Gutiérrez et al., 2000). This rationale means that every individual, due to his or her characteristics, can respond in a different way before a stressful situation, that is, the same response pattern cannot be applied to all individuals. This was observed by some authors such as Kobasa (1982; quoted by Gutiérrez et al., 2000), who supported her argument on the fact that the individual was able to cope and overcome challenges even starting from adverse situations (it is called healthogenic approach in Psychology). Therefore, she suggests that the characteristics of the individual, together with those of the social context can promote health processes. Thus, “the individual can both create as well as react before vital events in his life, and tolerate and enrich himself from stressful situations” (Peñacoba & Moreno, 1998; p.62). Fig.3. The subject and the social environment in health processes. Source: author’s own creation. It is the quality to believe in the truth, relevance and value of what you are, and what you do (…) it includes the trend to engage in all activities of life, including work, interpersonal relationships, and social institutions (Peñacoba et al., 1998; p.64). The commitment has been suggested as moderator of stress effects because it reduces the threat caused by stressful stimuli. At the same time, it means that the individual is aware of his own goals and his ability to make decisions and keep his values, something essential for the perception and management of any situation. An individual with commitment experiences a feeling of community, therefore he feels he is able to help others under stressful situations and that they count on his support. Besides, he has both, the abilities and the desire to face stressful situations successfully. Is the trend of thinking and acting with the conviction of personal influence in the course of events. People with this quality look for explanations about the reasons for events, not only in the actions of others, but also in their own responsibility (Peñacoba et al., 1998; p.65). The same as happens with commitment, it has been demonstrated that control also seems to soften effects of stress (Averill, 1973; Glass, Singer and Friedman, 1969; Lefcourt, 1978; Seligman, 1975; quoted by Peñacoba et al., 1998). The individual with the control capacity can predict consequences of his own activity in most of stressful events experienced. This allows managing stimuli for his own benefit, feeling capable of acting in an effective manner and of turning stressful events into part of his value system instead of something disturbing. Refers to the belief that change, compared to stability, is the usual characteristic of life. From this conception of change, most of the dissatisfaction associated to the onset of a stressful event can be avoided if it is understood as an opportunity and an incentive for personal growth, and not as a simple threat to the individual’s own safety (Peñacoba, 1998; p.65). Thanks to this perspective, the individual invests his efforts in facing change from a cognitive flexibility and tolerance to ambiguity allowing him to perceive the threat in an effective manner before stressful events even when these are unexpected. This component provides healthy states through a direct route, such as the positive perception of change, and another indirect route, because since there is no effort invested in the perception of threat, it can be used in the effective coping of the situation and searching for resources instead. Many authors agree that the resistant personality seems to reduce negative effects of stress through two main mechanisms: a different perception of events and a more effective use of coping strategies (that is, coping problems in a more optimistic manner regarding the final result) (Moreno et al., 2014). During the IV Communication and Events Congress held in Madrid the past March, 2016 (organized by ISCE/ISEMCO, with the support of diverse universities, public institutions and communication agencies), Campos mentioned that the profession of the event manager or event planner is known in most of the world and specially valued and respected in the United States of America, Asia and Great Britain’s United Kingdom (an issue developed in her blog, Campos, 2016). However, she added that in Spain the sector of events and its workers have relatively low visibility. In front of the absence of a formal definition of the professional of events organization, and being this one, the main stakeholder of the present research, we suggest he or she is considered as the professional performing his or her work in an active manner within, at least, one of the phases involved in the process of event management, being aware of the total or partial functioning of all of them. This definition considers stages suggested by Fuente (2012), that is: 1) Estimation phase, 2) Information phase, 3) Data collection phase, 4) Draft phase, 5) Technical discussion phase, 6) Project and planning phase, 7) Organization phase, 8) Selling phase, 9) External and internal communication phase, 8) Drill phase, 9) Execution phase and 10) Evaluation phase. At this point, it is important to distinguish the different functions and profiles that a professional in this sector can acquire inside a same event. Regarding the competences of the event planner, Campos mentioned the following (Campos, 2016): Capacity to manage time since managing work and prioritizing tasks is of upmost importance. Be very organized. Have communication and sociability abilities. Creativity in both thinking and action. Resolution capacity. Decision making capacity. Vocation for teamwork. Observation capacity. Negotiation capacity to achieve the best services at the lowest cost. Detail-oriented. Capacity to work under pressure. Good physical condition (even though it might seem strange, you must be fit to resist pressure, to endure long work shifts and for helping in assembling and disassembling of events). Fond of technologies. Capacity to learn quite fast. Love to travel and not looking for a routine work. Capacity to elaborate budgets and execute them. Capacity to solve unexpected events. Master languages. Schedule and geographical availability. Considering the competences and abilities of the professional of events organization and in synthesis with stress models, we notice that professionals of this sector undergo a series of demands that, in case of not being well managed, might become a source of stress and derive into health problems. Moreover, there is a relationship between health, stress and burnout among individuals working in the tertiary productive sector (Toh, Devi and Kim, 2011; quoted by Becerril, 2015) such as events organization. According to what is evidenced on the website of labor statistics of the United States of America (already mentioned in the previous section), event planners often work without the needed rest, diet, etc., when they are immersed in the development of a project. As they get closer to major events, they usually work many additional hours to complete preparations and during meetings or conventions, so they do not enjoy the needed and usual rest. This doesn’t only mean that professionals of this area work more consecutive hours than established (under general labor agreements, because there is no specific one), but that they keep performing their work during the usually stablished leisure time (i.e. weekends, holidays). And the problem is that they do not compensate with a day off, but they continue with the post-event activity instead, connecting with the following events they are engaged in (therefore it is difficult to conciliate personal and professional life in a continuous manner). Another risk factor for work stress in these professionals is that planning their work can be very limited, because they do not have a fix schedule compared to other more conventional jobs. This could be health-threatening since the needed rest periods are not respected, besides reducing the perception of control in events professional of their working schedule. However, up to the date this is nothing more than an inference (part of the stereotype in consolidation evaluated herein), because we haven’t found rigorous and open access researches that study work stress, nor quality of life of professionals in event organization in particular so far. Lastly, the results of the survey of the job website Careercast is worth mentioning, which published at the end of 2015 a list with the most stressful jobs in United States of America in the year 2016. Results positioned the event planner as the fifth most stressful job, only surpassed by the professions of enlisted military personnel, firefighter, airline pilot and police officer. Regarding communication agencies (as work environment of event planners), as Campos says, the most relevant trend observed in said organizations is precisely their human dimension and, more and more, the detail-orientation and a greater customization, that allows marking a difference (like industry of emotions, Campos, 2016b). Thus, as mentioned by the author, one of its greatest challenges is precisely to recruit and manage talented individuals able to respond to the new demands of the public: move, impact, impress. These are tough and demanding actions that must be integrated in a set of communication plans. Therefore, it seems coherent to at least question whether professionals of the communication sector suffer work stress to a higher or lesser extent than event planners before demands that are not that different. The sample consisted of a total of 192 participants (72 men, 120 women; age average= 40.02 years old, SD= 11.06), whereas 96 were professionals of event organization (41 men, 55 women; age average= 38.81 years old, SD= 9.39) and the remaining 96 (31 men, 65 women; age average = 41.23 years old, SD= 12.44) were from other areas. All of them were informed about the anonymity of their responses and personal data. Firstly, an online survey was elaborated, were there could be access from any device with Internet connection to answer to each one of the items (see above Annexes). The first section to complete was personal data: age, gender, years of professional experience, work area (events vs. other) and job position. In the second section there were instructions and the 15 Likert-scale items of the MBI-GS survey (Maslach Burnout Inventory-General-Survey), with which were obtained the burnout scores used as measure of work stress. In the third and last section of the document, there were instruction and the 15 Likert-scale items of the CRL questionnaire (Occupational hardiness questionnaire), with which were obtained the scores in work resistance used as a measure of tolerability to work stress. Afterwards, a search of the companies specialized in events organization was done, to whom the link to the survey was sent through email. 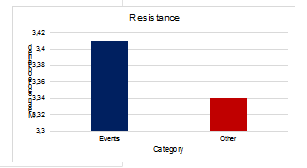 The total number of responses obtained within the category “events organization” was 96. Simultaneously, the questionnaire was disseminated during April 2016 in a randomized manner among professionals of companies not related with events organization, obtaining a total of 99 responses. The temporality of responses was the criterion to delete the three last responses obtained in this category in order to have the same sample size in both groups (n=96). Fig.4. 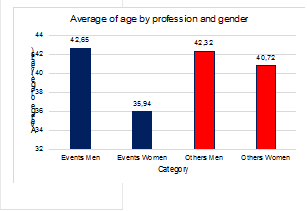 Number of participants by profession. Source: authors’ own creation. Fig.5. 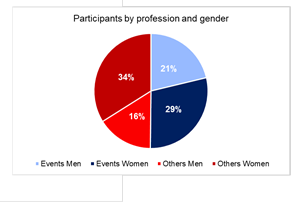 Percentage of participants by profession and gender. Source: authors’ own creation. In first place, the statistic Cronbach alpha (adapted for this study, see above) was used as measure of internal consistency to analyze the reliability of burnout scales: exhaustion (BD), cynicism (BC) and efficacy (BE); as well as resistance: commitment (RCP), control (RCT) and challenge (RTT). 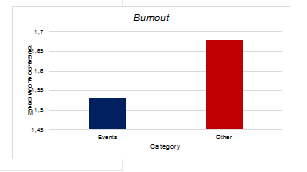 This allowed assuming that both burnout items as well as tolerance measured, respectively, a same construct and that they were highly correlated. In order to examine whether there existed significant differences in burnout and resistance levels between the group of events organization professionals and the control group, the Levene test was performed in first place to assume the equality of variances in both groups and, once the equality was verified, the T test for independent samples was done. Results indicated there weren’t statistically significant differences at a level of 0.05 (p <0.05) between scores obtained in both groups for burnout nor resistance. Fig.6. Average of age of participants. Source: authors’ own creation. Fig.7. 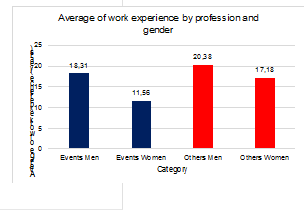 Average of years of work experience of participants. Source: authors’ own creation. Fig.9. Mean score obtained in resistance by category. Source: authors’ own creation. Fig.10. Levene and T Test for burnout: group statistics. Source: author’s own creation. Fig.11. Levene and T tests for burnout: independent samples test. Authors’ own creation. Fig.12. Levene and T Test for resistance: group statistics. Author’s own creation. Fig.13. Levene and T Test for resistance: group statistics. Author’s own creation. Fig.14. Single factor ANOVA for burnout and resistance. Source: authors’ own creation. Fig.16. Correlations between professional experience and resistance. Source: author’s own creation. The main objective of this study was to compare the levels of work stress (measured through burnout scores) and tolerance to it (estimated through scores obtained in resistance), between a group of event organization professionals and a group of professionals (control) in other work areas of communication agencies. Therefore, it would be possible to confirm or reject a prejudice of the sector, by which a greater level of stress and tolerance to it is attributed to event planners. After performing statistical calculations belonging thereto (see below), it was confirmed that there weren’t significant differences between both groups in the work stress levels, rejecting the main hypothesis that events professionals, considering their workload peaks (less rest, worst diet, etc. ), suffered more work stress than the professionals of the sector (even, from other sectors related thereto). Besides, no significant differences were observed between men and women in the levels of work stress between both groups. We didn’t find significant differences in tolerance to work stress in both groups either, rejecting the second hypothesis that professionals of the sector of events organization presented a greater tolerance to work stress compared to the professionals of other areas. Likewise, to the previous case, there weren’t significant differences between men and women regarding tolerance to work stress between both groups. The third and last hypothesis of the study (the more professional experience of employees, both in events organization as well as other related areas, the greater their tolerance to stress), was also rejected since no significant correlation was observed between the years of professional experience and tolerance to work stress whatsoever (instead, it is related more to the combination of temperament, character and personality – even though is true that a frequent trait among event planners is their high level of responsibility, but a specific study supporting this is required-). We didn’t find significant correlations between work stress (burnout) and the years of work experience, a result that coincides with other studies that didn’t find significant correlations between these two dimensions either. (Limonero,Tomás-Sábado, Fernández-Castro & Gómez-Benito, 2004). Thus, work experience itself doesn’t seem to have any effect over stress (but the wrongly called work flexibility does, Sánchez-Bayón, 2016). This is especially eye-catching because the fact that a higher number of years of work experience doesn’t correlate with tolerance to stress might seem counterintuitive, since we could think that the more number of years worked, the higher the number of small resources against stress the employee might be able to generate in the everyday life. Although, on the other hand, a continuous exhaustion may occur as well, as is seen on individuals diagnosed of burnout (because stress sustained over time stops being stimulating to become a depressor, see below). The case is that the research does not offer clarity about it, therefore it cannot be conclusive about the issue. After the study of different specialized publications carried out to perform this paper, we noticed the absence of a formalized definition of the event organization professional profile. Therefore, it is not surprising that there is a lack of studies about the effects of work stress on these professionals, since their profile was not yet defined. Because of this, this research has tried to contribute with a formal definition of it in an attempt to promote its standardizing (as well as to promote its own technical-professional slang, Sánchez-Bayón, 2014). In this defining line, Campos (2016a), indicates the need to work with corresponding entities to stablish common denominations of the professional profiles of events organization and to promote their acknowledgement. It is important to highlight that there still doesn’t exist a completely equivalent and unified term to refer to the professional of event organization, not even in English, where diverse expressions are used such as event planner, event manager o meeting, convention and event planner. Regarding future research lines, in first place, we suggest to perform a research project that includes a higher number of participants and that considers further variables that may impact results and specially burnout levels, such as number of weekly working hours, sleep hours, perceived control over work, marital status, number of children and hours invested in their care (if applicable) to obtain a measure of the workload at home, as has been done in other studies about burnout (Albaladejo et al., 2004). The hypothesis of this study based on the premise that events organization professionals suffered more work stress and also had a greater tolerance to it. After being rejected, we suggest to elaborate new ones to try to explain results obtained. We could formulate hypotheses, for example, that professionals of events organization do not suffer burnout to a higher extent than the rest due to levels of motivation, resilience and/ or engagement high enough to work as protection factors against work stress, therefore we would need to measure levels in said variables presented by participants. At this point, it might be convenient to remember that high scores in these variables soften the possible causes of burnout(Soria, 2005). At the same time, the role of emotional intelligence in work stress and protection factors against it is interesting, since high levels in emotional intelligence are related with lesser levels of burnout (exhaustion and cynicism, higher efficacy levels), less perception of stress and superior engagement scores (vigor, dedication and absorption, Pacheco, Durán & Rey, 2007; Maslach, 2001). Therefore, we suggest the prevention of work stress through education in emotional intelligence together with educational interventions in the work field, to improve the capacity of individuals to cope with the work environment, since interventions in burnout are mainly focused on individual-oriented solutions (i.e. working on individual strategies for the employee and thus, strengthen internal resources, Maslach, 2001). However, we mustn’t neglect the situational and organizational factors in prevention, because they seem to play a role as important or more than individual factors. The intervention suggested to cope with work stress would combine changes in the management practices (i.e. organizational environment, Duarte et. al, 2012), weekly group sessions designed to identify ways of reducing inequalities employees perceive in their work situation) together with mentioned educational interventions, because as Maslach (2001) indicates, it seems to be the most efficacious type of intervention. Lastly, we suggest performing a more exhaustive and complete study about occupational health in event organization professionals, as well as its promotion in the sector, without forgetting the multifactorial nature of occupational health and the difficulties when it comes to promoting it due to the simultaneous actions of macrosocial variables that are often out of the individual’s control (Becerril, 2015). In this line, we encourage in-depth research about burnout in organizations from the perspective suggested by Pérez-Huertas & Sánchez-Bayón (2015), who present an alternative vision of them based on Power Games suggesting that in many organizations there are individuals and groups that “act as strategic agents, trying to protect their own interests mobilizing specific sources of power” (Hansen & Küpper, 2009; quoted by Pérez-Huertas & Sánchez-Bayón, 2015, p. 96). Thus, burnout and other types of work stress could be conceived as consequences of a bad management in the organizational structures and its functioning. Besides, these authors mention that business organizations are in a constant transformation process, with its subsequent uncertainty and the continuous need of adaptation. This has promoted that the employee detaches from the company as project and perceives his professional career as a “series of jobs, occasionally alternated with unemployment episodes, projecting his professional career as a development independent from the organization it takes place” (Pérez-Huertas & Sánchez-Bayón, 2015; p. 94). At the same time, it seems that employees no longer relate in the same way with the company, since they are not identified as part of a common long term project and that “understand their work relationships as a punctual and ephemeral episode in their careers” (Pérez-Huertas & Sánchez-Bayón, 2015; p. 94). Pérez-Huertas & Sánchez-Bayón also indicate there are scenarios where the members of organizations move according to their personal interests independently of whether these are aligned or not with the general interests of their respective organizations. Thus, companies can be defined as spaces where “different individuals or groups of individuals interact in order to defend their specific interests and projects (Pérez-Huertas & Sánchez-Bayón, 2015; p. 94). Moreover, it seems that “the company starts to blur as a subject, to become a mere object or operations market and secret agendas” (Pérez-Huertas & Sánchez-Bayón, 2015; pp. 95). In this aspect, the researches on organizational leadership and influence strategies in the already mentioned Power Games play a relevant role (Michelson, 2010; quoted by Pérez-Huertas & Sánchez-Bayón, 2015) if the organization is considered as “a set of microstructures of power that operate through micropolitical actions where the different agents act strategically and participate in games of power” (Pérez-Huertas & Sánchez-Bayón, 2015; p. 96). Therefore, from this paper we encourage the use of the already existing tools of analysis, such as the Power Games Scale of Martins, Paz and Cortés (2000), based on the Theory of Organizational Power of Mintzberg and that allows assessing the configurations of power of organizations, political games developed therein and the basis of power of agents involved and the games (Paz, 1997; Flauzino et. al, 2001; Cortés, 1997; quoted by Pérez-Huertas & Sánchez-Bayón, 2015; p. 105). Besides, as Pérez-Huertas (2015) mentions that “most of the success of the Power Games School has been due to its ability to diagnose and prognose interactions in companies and their pathologies” (p.13). Therefore, there is an attempt to study and improve the organizations functioning as well as the underlying mechanisms that could promote the onset of burnout and other types of work stress in employees belonging therein. In any case, it is about acting towards the improvement of the quality of life of events organization professionals, betting on the design and implementation of adequate schedules and workload and on the acknowledgement of the task they perform. We mention the need to use a unified term which to refer to the events organization professional to enable and make the study of its profile easier, as well as its activity and occupational health. Likewise, its study and monitoring is considered necessary to favor of the acknowledgement of the task they perform, thus improving the visibility of their figure in our society. Finally, we must remember that this research is a first attempt to generate valid scientific-academic knowledge, in the field of events organization, a starting point from which to build knowledge that allows to analyze and improve occupational health, and with it, the quality of life of this sector’s professionals. Therefore, we encourage scientific and rigorous research of the previously mentioned areas in this paper, using an adequate methodology and samples larger in size and more equivalent (than the ones in this study), enabling a generalization of results obtained. Albaladejo, R., Villanueva, R., Ortega, P., Astasio, P., Calle, M. E., & Domínguez, V. (2004). “Síndrome de Burnout en el personal de enfermería de un hospital de Madrid”. Revista Española de Salud Pública, 78 (4), 505-516. Becerril, A. S. (2015). “Salud, burnout y estrés en ámbitos laborales. Una revisión sistemática”. Psicología y Salud, 25(2), 147-155. Boada, J. y Ficapal, P. (2012). Salud y trabajo: Los nuevos y emergentes riesgos psicosociales. Madrid: UOC. Bosma, H., Marmot, M. G., Hemingway, H., Nicholson, A. C., Brunner, E., & Stansfeld, S. A. (1997). “Low job control and risk of coronary heart disease in Whitehall II (prospective cohort) study”. Bmj, 314 (7080), 558. Campos, G. (2016a). Eventos corporativos. Porto: Ed. Sindéresis. Campos, G. (2016b). La industria de las emociones. Porto: Ed. Sindéresis. Campos, G. (2008). Producción de eventos. La puesta en escena del protocolo. Madrid: Ediciones Protocolo. Campos, G., & Lafuente, C. F. (2013). “Los eventos en el ámbito de la empresa. Hacia una definición y clasificación”. Revista de Comunicación de la SEECI, (32), 73-105. Casanova-Sotolongo, P., Lima-Mompó, G., Aldana-Vilas, L., Casanova-Carrillo, P., & Casanova-Carrillo, C. (2003). “El estrés ocupacional como una de las preocupaciones de la salud pública actual”. Revista de neurología, 36(6), 565-567. Duarte, J. A. L., Dessens, L. F. R., & Miranda, J. O. (2012). “Estudio de validez factorial del síndrome de Burnout y engagement en estudiantes universitarios de ingeniería”. Alternativas en Psicología, 16 (27), 42-53. Fernet, C., Guay, F., & Senécal, C. (2004). Adjusting to job demands: The role of work self-determination and job control in predicting burnout. Journal of vocational behavior, 65(1), 39-56. Fuente, C. (2007): “Protocolo para eventos”. Técnicas de organización de actos. Madrid: Ediciones Protocolo. Fuente, C. (2014). Manual práctico para organización de eventos: técnicas de organización de actos II. Oviedo: Ediciones Protocolo. Ganster, D. C., & Rosen, C. C. (2013). “Work stress and employee health: A multidisciplinary review”. Journal of Management, 39(5), 1085-1122. Godoy-Izquierdo, D., & Godoy, J. F. (2002). “La personalidad resistente: una revisión de la conceptualización e investigación sobre la dureza”. Clínica y Salud, 13(2),135-162. Gutiérrez, J. L. G., Hernández, E. G., & Jiménez, B. M. (2000). “Personalidad resistente, burnout y salud”. Escritos de psicología, (4), 64-77. Hansen, N. K., & Küpper, W. (2009). “Power Strategies and Power Sources of Management”. The Micro-Politics of Strategizing, Paper for presentation at the 25th EGOS Colloquium. Hobfoll, S. E. (1989). “Conservation of resources: A new attempt at conceptualizing stress”. American psychologist, 44(3), 513. Kobasa, S. C. (1982). “The hardy personality: Toward a social psychology of stress and health”. Social psychology of health and illness, 4, 3-32. Lazarus, R. S., & Folkman, S. (1984). Stress, appraisal, and coping. New York: Springer publishing co.
Limonero, J. T., Tomás-Sábado, J., Fernández-Castro, J., & Gómez-Benito, J. (2004). “Influencia de la inteligencia emocional percibida en el estrés laboral de enfermería”. Ansiedad y Estrés, 10(1), 29-41. Maslach, C., Jackson, S. E., & Leiter, M. P. (1997). “Maslach burnout inventory”. Evaluating stress: A book of resources, 3, 191-218. Maslach, C., Schaufeli, W. B., & Leiter, M. P. (2001). “Job burnout”. Annual review of psychology, 52(1), 397-422. Michelson, B. J. (2010). “Leadership and Power Base Development: Using power effectively to manage diversity and job-related interdependence in complex organizations”. Concepts for Air Force Leadership, 193-199. Monte, P. R. G. (2013). “Situación actual y perspectiva de futuro en el estudio del estrés laboral: la Psicología de la Salud Ocupacional”. Informació psicológica, (100), 68-83. Moreno Jiménez, B., Rodríguez Carvajal, R., & Escobar Redonda, E. (2001). “La evaluación del burnout profesional. Factorialización del MBI-GS”. Ansiedad y estrés ,7 (1), 69-77. Moreno Jiménez, B., Rodríguez Muñoz, A., Garrosa Hernández, E., & Blanco Donoso, L. M. (2014). “Development and validation of the Occupational Hardiness Questionnaire”. Psicothema, 26(2), 207-214. Pacheco, N. E., Durán, M. A. D., & Rey, L. (2007). “Inteligencia emocional y su relación con los niveles de burnout, engagement y estrés en estudiantes universitarios”. Revista de educación, (342), 239-256. Paz, M. G. (1997). “Avaliação de desempenho ocupacional e estruturas de poder”. Trabalho, organizações e cultura, 151-172. Peñacoba, C., & Moreno, B. (1998). “El concepto de personalidad resistente. Consideraciones teóricas y repercusiones prácticas”. Boletín de Psicología, 58, 61-96. Pérez, A. M. (2010). “El síndrome de burnout. Evolución conceptual y estado actual de la cuestión”. Vivat Academia, (112), 42-80. Pérez-Huertas, J. L., & Sánchez-Bayón, A. (2015). “Aportación Iberoamericana a la Nueva Gestión: Historia crítica de la Escuela de Juegos de Poder”. Miscelánea Comillas. Revista de Ciencias Humanas y Sociales, 72(142), 93-110. Rodríguez Carvajal, R., & Rivas Hermosilla, S. D. (2011). “Los procesos de estrés laboral y desgaste profesional (burnout): diferenciación, actualización y líneas de intervención”. Medicina y Seguridad del trabajo, 57, 72-88. Rosa, M. A. S., Albiol, L. M., & Salvador, A. (2009). “Estrés laboral y salud: Indicadores cardiovasculares y endocrinos”. Anales de psicología, 25(1), 150-159. Salanova, M., Schaufeli, W. B., Llorens, S., Peiró, J. M., y Grau, R. (2000). “Desde el ‘Burnout’ al ‘engagement’: ¿una nueva perspectiva?” Revista de Psicología del Trabajo y las Organizaciones, 16(2), 117-134. Sánchez-Bayón, A. (2016). Problemas y retos para alcanzar la sociedad del conocimiento. Madrid: Delta. Sánchez-Bayón, A. (2014). Innovación docente en los nuevos estudios universitarios. Valencia: Tirant lo Blanch. Sandín, B. (2003). “El estrés: un análisis basado en el papel de los factores sociales”. Revista internacional de psicología clínica y de la salud, 3(1), 141-157. Schaufeli, W. B., Leiter, M. P., Maslach, C. y Jackson, S. E. (1996). Maslach Burnout Inventory General Survey. Palo Alto, CA: Consulting Psychologists Press. Schaufeli, W. B., Salanova, M., González-Romá, V., & Bakker, A. B. (2002). “The measurement of engagement and burnout: A two sample confirmatory factor analytic approach”. Journal of Happiness studies, 3(1), 71-92. Seligman, M. E. P., & Csikszentmihalyi, M. (2000). “Positive psychology”. American Psychologist, 55, 5-14. Selye, H. (1976). “The stress concept”. Canadian Medical Association Journal,115(8), 718. Shirom, A. (2011). “Job-related burnout: A review of major research foci and challenges”. Handbook of occupational health psychology (2nd ed.). (pp. 223-241) American Psychological Association, Washington, DC. Soria, M. S., Martínez, I. M. M., Esteve, E. B., Gumbau, S. L., & Gumbau, R. G. (2005). “Bienestar psicológico en estudiantes universitarios: facilitadores y obstaculizadores del desempeño académico”. Anales de psicología, 21(1), 170-180. Ortega, C.A.R. (2012). Burnout y engagement y sus efectos en Estudiantes de posgrados de la universidad de Sonora que conllevan a la determinación de su Eficiencia terminal (tesis de maestría, Universidad de Sonora). Pérez-Huertas, J. L. (2015). Juegos de poder en las organizaciones empresariales de la globalización: estudio crítico y comparado de las aportaciones de su escuela académica homónima (tesis doctoral dirigida por Prof. Dr. A. Sánchez-Bayón, UCJC). Agencia Europea para la Seguridad y la Salud en el Trabajo. La Cumbre de la campaña «Trabajos saludables» muestra cómo gestionar con éxito los riesgos psicosociales en el trabajo. Recuperado el 9 de marzo de 2016 de https://osha.europa.eu/es/about-eu-osha/press-room/heathy-workplaces-summit-shows-how-manage-psychosocial-risks-work. Agencia Europea para la Seguridad y la Salud en el Trabajo. Los riesgos psicosociales y el estrés en el trabajo. Recuperado el 9 de marzo de 2016 de https://osha.europa.eu/es/themes/psychosocial-risks-and-stress. American Psychological Association. El camino a la resiliencia. Recuperado el 10 de marzo de 2016 de http://www.apa.org/centrodeapoyo/resiliencia-camino.aspx. Bureau of Labor Statistics, U.S. Department of Labor, Occupational Outlook Handbook. Edition, Meeting, Convention, and Event Planners. Recuperado el 4 de marzo de 2016 de http://www.bls.gov/ooh/business-and-financial/meeting-convention-and-event-planners.htm. Campos, G. (20 de julio de 2015). Por qué estudiar Protocolo y Organización de Eventos [web log post]. Recuperado el 22 de marzo de 2016 de http://www.gloriacampos.me/por-que-estudiar-protocolo-y-organizacion-de-eventos/. Campos, G. (3 de octubre de 2015). Competencias, capacidades y habilidades en la formación universitaria de un/a organizad@r de eventos [web log post]. Recuperado el 22 de marzo de 2016 de http://www.gloriacampos.me/competencias-capacidades-y-habilidades-en-la-formacion-universitaria-de-una-organizadr-de-eventos/. Campos, G. (24 de enero de 2016). Perfiles profesionales de l@s organizadores de eventos [web log post]. Recuperado el 22 de marzo de 2016 de http://www.gloriacampos.me/perfiles-profesionales-ls-organizadores-ebentos/. Campos, G. (10 de marzo de 2016). Perfiles profesionales de la organización de eventos. #4congresoeventos #buildingbrand [web log post]. Recuperado el 22 de marzo de 2016 de http://www.gloriacampos.me/wp-content/uploads/2016/03/Congresos-presentacio%CC%81n.pdf. Careercast (2016). The Most Stressful Jobs of 2016. Recuperado el 3 de marzo de 2016 de http://www.careercast.com/jobs-rated/most-stressful-jobs-2016. Careercast (2016). Jobs Rated Most and Least Stressful Methodology 2016. Recuperado el 3 de marzo de 2016 de http://www.careercast.com/career-news/jobs-rated-most-and-least-stressful-methodology-2016. Integrative Therapeutics (2014). General adaptation syndrome (gas) stages. Recuperado el 12 de abril de 2016 de http://www.integrativepro.com/Resources/Integrative-Blog/2014/General-Adaptation-Syndrome-Stages. IBM Knowledge Center. Página de bienvenida de SPSS Statistics. Recuperado el 10 de mayo de 2016 de http://www.ibm.com/support/knowledgecenter/SSLVMB/welcome?lang=es. Instituto Nacional de Seguridad e Higiene en el Trabajo. NTP 732: Síndrome de estar quemado por el trabajo "Burnout" (III): Instrumento de medición. Recuperado el 22 de marzo de 2016 de http://www.insht.es/InshtWeb/Contenidos/Documentacion/FichasTecnicas/NTP/Ficheros/701a750/ntp_732.pdf. Onet Online. Summary Report for: 13-1121.00 - Meeting, Convention, and Event Planners. Recuperado el 4 de marzo de 2016 de http://www.onetonline.org/link/summary/13-1121.00. On the following pages there are 15 statements of job-related feelings. Please, indicate using a 0 to 6 scale (whereas 0 is "never" and 6 "always") your level of agreement with each one of them. Remember there are no right or wrong answers. 0 = Never / Not once. 1 = Almost never / A few times a year. 2= Sometimes / Once a month or less. 3= Regularly / A few times a month. 4= Often / Once a week. 5= Almost always / A few times a week. 6= Always / Every day. On the following pages there are 15 job-related statements. Please indicate using a 1 to 4 scale (whereas 1 is "totally disagree" and 4 "totally agree") your level of agreement with each one of them. Remember there are no right or wrong answers. 1= Totally disagree. 2= Disagree. 3= Agree. 4= Totally agree. Article received on 2 August 2017. Accepted on 11 November. Published on 16 November 2017.